Final Fantasy 15 review: "Humanity and warmth shine through even when the story leaves you cold"
Even when it stumbles, Final Fantasy 15's ambitious open-world, fast-paced combat, and the humanity of its four leads make it a fascinating adventure to behold. Final Fantasy 15 revels in the small moments. It's a surprising thing to say about a game starring four impossibly-coiffed anime boys with big swords taking to the streets in their souped-up roadster. But even as much as its big, explosive action sequences left me awestruck and its sweeping narrative left me perplexed, the thing I think back on most fondly are those small memories I made with my crew. Sharing a meal next to a campfire to prepare for the morning's deadly monster hunt, the mouth-watering dishes providing my team important stat buffs and elemental resistances. Driving to my next destination in silence (or the radio tuned to one of hundreds of tunes from a history of Final Fantasy games), looking around at impossible rock formations while watching my buds chat together or read a book in their car. Sorting through photos of my adventure and saving the ones I liked best. Getting a pat on the back after executing a particularly deadly Link Strike against a formidable foe. 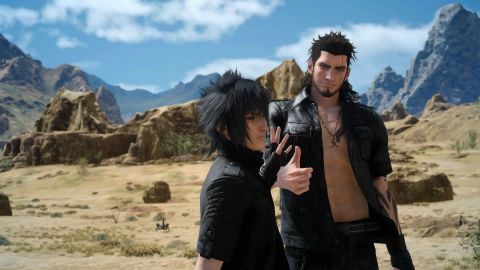 Camaraderie is at the heart of Final Fantasy 15's grand adventure, and even when it falters, its four bros will be right there to see you through to the end. The world of Eos feels real and lived in, resembling the highways and byways of the American heartland as much as it is wholly alien, and its heroes are our window into this beguiling place. After a surprising intro which hints at the tribulations to come, the story pulls back to the beginning, where a young Prince Noctis leaves the safety of the grand city of Insomnia to head to the distant kingdom of Altissia. He's supposed to marry Lunafreya, a powerful Oracle he only met a handful of times as a child, a union that's as much genuine as it is politically motivated. As Noctis makes his way to the ferry that will whisk him to his destination, he learns that his kingdom has been invaded by the evil Nifelheim empire, he is now king, and must change his plans to scour the countryside for ancient weapons and powers that will help him launch a counterstrike. It's pure Final Fantasy nonsense - talk of crystals and kingdoms and chocobos and the like - but for the first 20-30 hours or so, it mostly gets out of the way to let you soak up its reality-meets-fantasy landscape and explore it at your own pace. You don't need to watch the feature-length Kingsglaive film or the 50-minute-long Brotherhood anime series to enjoy Final Fantasy 15, but how much you understand of the politics and the finer points of its world will likely depend on it. A brief lore primer in the game's tutorial and a few in-game montages from Kingsglaive help fill in a few of the gaps, but they're hardly enough to really explain the events that set Noctis' quest into motion or even the motivations behind the villainous Empire beyond the broadest of strokes. Instead, Final Fantasy 15 focuses its attention almost entirely on our band of four anime misfits, who do wonders to ground things in some semblance of reality. Joining Noctis are three of his best friends and confidants: Ignis, master strategist and master chef; Gladiolus, the burly protector of the Lucian throne; and Prompto, Noctis' best friend and photography enthusiast. Together, they'll fight deadly monsters, chat about the weather, give each other encouragement and praise when something goes right, and worry about each other when things go wrong. It's genuinely refreshing to play a game - especially a Final Fantasy game - where its protagonists so thoroughly enjoy each other's company. The English voicework and dialog is incredibly silly and deeply entrenched in its anime roots, but when held up to this strange world and its juxtaposition of mechs, monsters, and 50's-themed diners and European-inspired cities, it all sort of fits together. Together with your crew, you'll take on larger story missions, which run the gamut from stealthy infiltration runs into the heart of an Imperial garrison, to dungeon crawls, to spectacular fights against gods and monsters alike. Smaller side quests and hunts flesh out the activities you'll complete for extra experience points and cash, with missions as simple as finding discarded dog tags to multi-step tasks that send you off the beaten path into forests, swamps, and caves. Without this group of heroes, Final Fantasy 15 would fall apart, as they are your compass to guide you through its nonsensical story, your center when you find yourself scrambling for context, and your anchor in combat. If you're looking for a less twitchy, more tactical experience with Final Fantasy 15's combat, simply hop into the options menu and switch on Wait Mode, and time will stop moving when you stand still. Here, you'll be able to plan out your next move, choose your next target at will, and even scan enemies for weaknesses. Once you start moving or attacking, everything plays out in real-time again, so it's not quite the turn-based combat of yore, but it'll help those looking for something a bit more strategic. I personally preferred the frenetic action of Active Mode combat, but if you need to take a minute to catch your bearings, it's easy to switch back and forth at will, and the game doesn't penalize you either way. As much as it is in its open-world design, teamwork and companionship are the soul of Final Fantasy 15’s combat system, which drops the series mainstay turns and time gauges for completely real-time action. It's a little clumsy at times - the camera and lock-on targeting have a tendency to fight against you - but when it works, it's absolutely incredible. Combat isn't just about strategizing weaponry - it's about owning three-dimensional space. Noctis is the only one on the team who has access to a Warp Strike, a powerful ability that lets him flit to and fro across the battlefield. Throw in magic - elemental grenades you can craft and chuck into battle - and battles quickly brush right up against pure chaos. Staying alive requires that you stay mobile at all times, blocking and countering attacks, and changing up strategies on the fly as you position yourself to coordinate attacks with your teammates. Even the Ascension Grid - Final Fantasy 15's web of upgradable skills and abilities - is filled with constant reminders that it's not all about you; your pals are just as important to your quest, and you'll call upon them frequently to help you get through its challenges. Combat and quests aren't new to RPGs or even Final Fantasy, but Final Fantasy 15 elevates them by infusing an incredible amount of humanity in even the most mundane of activities, and much of it is thanks to goofball Prompto. You'll enter a new region and he'll notice a sign pointing you to a chocobo ranch. Suddenly he's like a kid in a candy store, begging you to take a detour to stop by and check it out. Sometimes he'll sing the series' iconic victory theme when you successfully complete a battle. Driving past landmarks will cause him to pipe up, requesting everyone stop for a minute so you can get a group photo, which you can then save and post to your social network of choice. It's amazing how the mere act of sorting through photos at the end of each day and picking the ones you like best fills Final Fantasy 15 with so much life; you're not just playing a game, you're forging memories with your virtual best friends. While many are sure to have their own favorite character (Ignis and his ever-growing catalog of delicious recipes is a close second), for me, Prompto is the glue who holds everything together. It's that humanity in its main protagonists and how they react to the world that highlights how poorly its supporting cast fares by comparison. Characters like the ridiculously-dressed greasemonkey Cindy, the elegant Lunafreya, the evil Emperor Iedolas of Nifelheim, and even the scene-chewing Ardyn Izunia get varying amounts of screen-time, but it's not nearly enough to really get a chance to delve into their history and get to know them like we know Noctis and his friends. There are the hints of something deeper with each of these characters, but Final Fantasy 15 spends so much time letting us enjoy the open road that it sometimes forgets that there are other people involved. During the first half of the game, this isn't that much of a problem, as it's simply a joy to take on quests and fight monsters with your buds, letting the narrative sort of wash over you while you drive between rest stops. Once the story starts taking over, though, Final Fantasy 15 is practically on rails, funnelling you through its final chapters with one encounter after another until you hit the finale. This half will easily go down as one of its most divisive elements as it drops the open world and party-based structure almost entirely for a handful of linear events, one-off battles, and a lengthy dungeon that requires you to forget everything you thought you knew about its combat in favor of something so radically different you'll wonder if it originally belonged in totally different game. Story elements that were never introduced up until this point are now given sudden import, plot twists are thrown at you without proper explanation, and the ending has the kind of ambiguity we haven't seen in the series since Final Fantasy 7. It's... kind of a mess. But even when the story makes no sense, there's no denying what a gamble its final moments are, keeping you on your toes with a constant barrage of surprises. These final chapters are much darker and more bleak than anything that's come before, testing our heroes' friendship to its limits. When the lore is zipping past you faster than you can keep track, it's this struggle that will guide you through to the conclusion, largely earning the emotional payoff of their journey, even as the story itself bewilders. Then again, the story behind the making of Final Fantasy 15 is kind of a mess too, and it's impossible to know how much of this mish-mash of ideas is the result of its tumultuous history as a spin-off that entered development hell a decade ago or whether this was always what it was meant to be. It's a beautiful mess, though; a fascinating, wonderful, exciting, bold, and often inscrutable mess with endless ambition and the fearlessness to at least try something new with staid genre conventions. Even when it falters, it's never dull, the humanity of its heroes and the warmth of its world shining through even when its story leaves you cold. And if that's not Final Fantasy, I don't know what is. Description Formerly Versus XIII, FFXV is the latest in the Final Fantasy series.